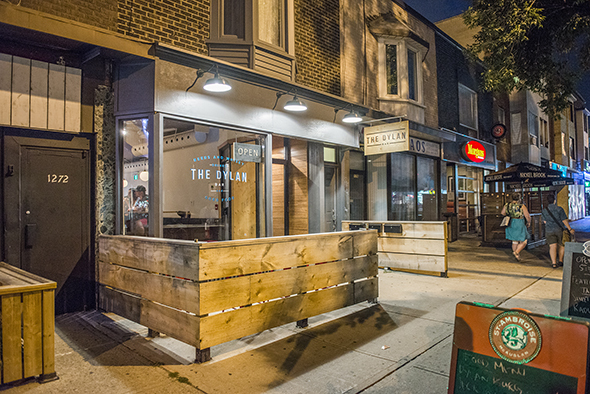 The Dylan is a bustling bar just a short walk from Greenwood subway station. It's named in the spirit of Dylans both Bob and Thomas, interested in capturing their spirit of creativity and tradition. 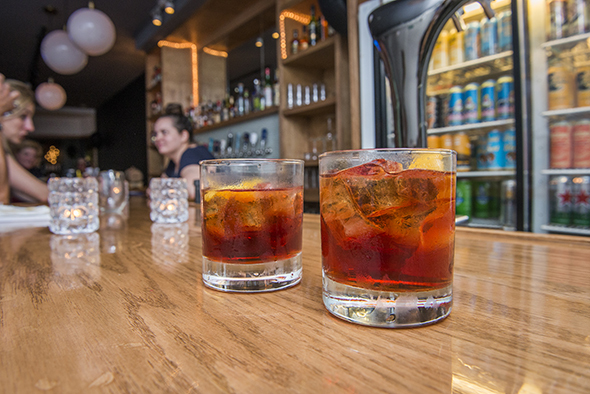 Here bartenders create booze-forward cocktails and a glass-doored fridge bursts with dozens upon dozens of tall cans of craft beer (local all $5.30). They also serve basic pub food, but don't ask for a menu: a server will just tell you orally. Those who love to linger over a leatherbound menu might find this annoying, but limited menu options make it charming and efficient and the practice goes well with the old-fashioned vibe. 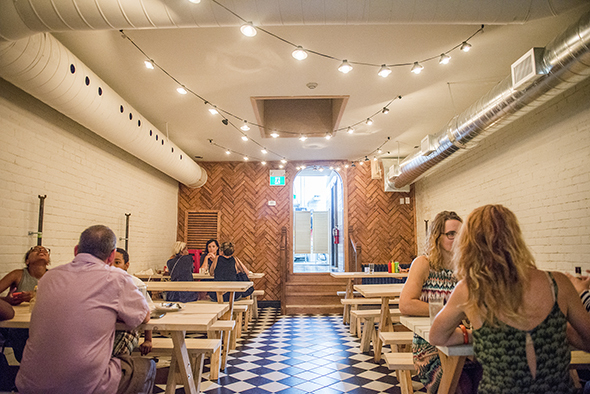 The interior is long and the bar on one side and high tables on another fill up quickly, as well as a large group table directly behind the front window. The long bar and tile throughout bring that same classic feel. Another small room at the back of the bar has additional seating in the form of picnic tables, through an arch custom built into the restaurant. The signature cocktail here is appropriately named The Dylan: it's two ounces of Forty Creek, ginger honey syrup, and their own freshly squeezed lemon juice topped off with orange peel and fresh shaved ginger. On top of that they "float" a small amount of Bowmore Twelve Year Old that imbues the entire rest of the drink with a peaty smell without being entirely composed of scotch. 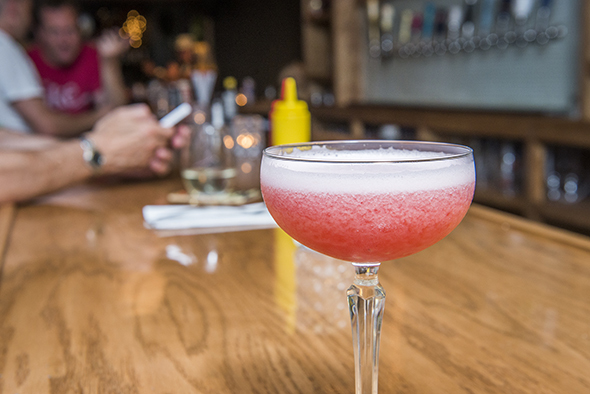 Then it's time for a Clover Club, named after an old location that served this cocktail in New York. It's gin, raspberry and lemon, basically a gin sour dry shaken with raspberry. All cocktails here at The Dylan are twelve dollars. Chicken wings are definitely in order after a few drinks, and their Jamaican jerk version ($14) hits the spot. 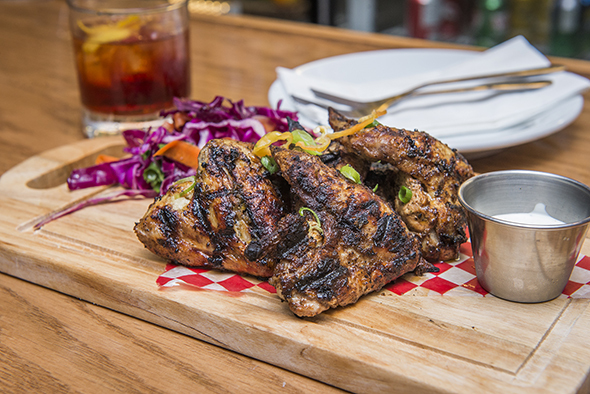 They're marinated for twenty-four hours in-house with scotch bonnets, and served as whole wings along with a mint crema that's a cool twist on ranch or blue cheese dressing, meshing well with the Jamaican jerk twist on the wings. You can also get a classic chicken curry ($14). There's a veggie option available too for $12. 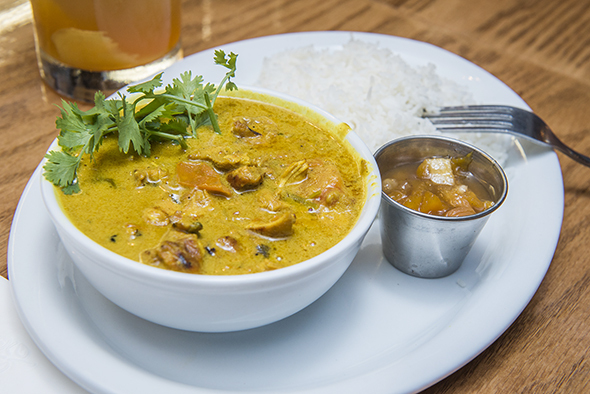 It's a yellow curry that's not too spicy, served with rice and house-made mango chutney. Perfect for the end of a hard day, or for laying a base for (more) drinks. If even veggie curry is still too much for you, they also have a kale salad for $12, so there are a few options here if you don't eat meat. 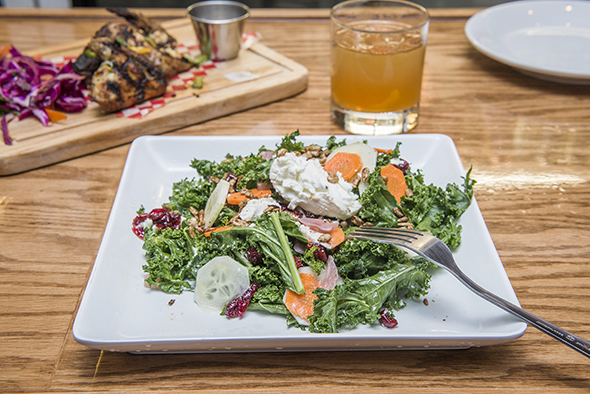 It's topped with a big dollop of goat cheese, pickled carrots, cucumber, dried cranberries and cumin roasted sunflowers that are made in house and good enough that they could be eaten on their own.